Purification The antibody was purified by affinity chromatography. Sujet CD366 (Tim-3) is a transmembrane protein also known as T cell immunoglobulin and mucin domain containing protein-3. 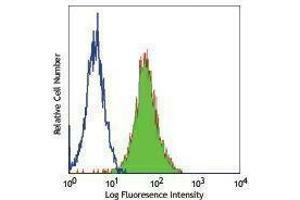 Tim-3 is expressed at high levels on Th1 lymphocytes and CD11b+ macrophages. Tim-3 has also been shown to exist as a soluble protein. Cells expressing Tim-3 are present at high levels in the CNS of animals at the onset of experimental autoimmune encephalomyelitis (EAE), a disease mediated by lymphocytes secreting Th1-like cytokines. Tim-3 has been proposed to inhibit Th1-mediated immune responses and promote immunological tolerance. Indications d'application Optimal working dilution should be determined by the investigator. Buffer Phosphate-buffered solution, pH 7.2, containing 0.09 % sodium azide. Stockage commentaire The antibody solution should be stored undiluted between 2°C and 8°C.